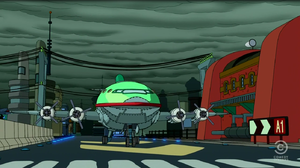 The Planet Express crew forms Plan Am, a commercial airline. The Professor invents the Banach-Tarski Dupla-Shrinker, and Bender accidentally creates millions of duplicates that threaten to destroy Earth (6ACV17). The duplicates leave Earth forever (6ACV17). Planet Express goes bankrupt, and the company is turned into a commercial airline. The first flight crash lands on an uncharted planet, and after finally coming home, Plan Am is closed down (6ACV20). The Young People's Choice Awards are held, and Turanga Leela wins for Best Children's Program for Rumbledy-hump. Later, the Cookieville Minimum-Security Orphanarium has all of its child inhabitants adopted by Abner Doubledeal to have them work on production of the rebooted reality version of the show (6ACV21). The common cold is reintroduced (6ACV24). This page was last edited on 27 December 2012, at 00:40.